Non enveloped, icosahedral, non-turreted virion with a double capsid structure, about 70 nm in diameter. 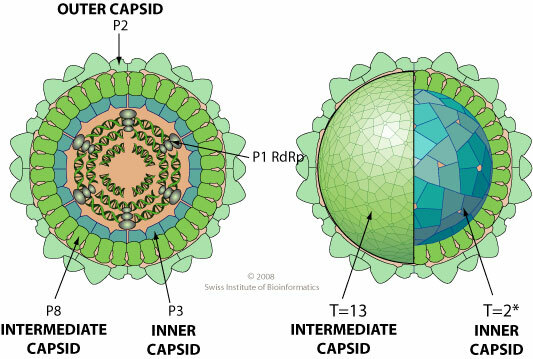 The outer capsid has a T=13 icosahedral symmetry, the inner capsid a T=2* icosahedral symmetry. Each double-layered capsid consists of 260 trimers of the major outer capsid P8 protein and 60 dimers of the inner capsid P3 protein. Segmented linear dsRNA genome. Contains 12 segments coding for 15 proteins. Segment 11 has two in-frame codons resulting in two ORFs. Segment 12 has two additional overlapping ORFs. Segments size range from 1066 to 4423 bp. Genome total size is about 26 kb (WTV). The dsRNA genome is never completely uncoated, to prevent activation of antiviral state by the cell in response to dsRNA. The viral polymerase synthesizes a capped mRNA from each dsRNA segment. This capped mRNA is translocated to the cell cytoplasm where it is translated. RDV expresses an additional protein by leaky scanning in the nsp12 gene. NATURAL HOSTS Plants: Oryza sativa for RDV and RGDV, dicotyledonous for WTV. TROPISM RGDV: Phloem or phloem-related cells. GEOGRAPHY RDV: Japan and Korea. RGDV: Malaysia, Thailand and China. ASSOCIATED DISEASES WTV: galls (tumor). RDV: dwarf (or stunt) disease of rice. RGDV: dwarfing, stunting, and galls. TRANSMISSION Insect vector: mechanical inoculation in plant by leafhoppers.